(Thanks to Geoffrey Greene for providing photos and additional information on this page. William Wilson SMART was born on 22 March 1850 in Moulton, Northampton and was baptised in the same place on 18 August 1850. With the rest of the family, he came to New Zealand later in the year 1850 on the Randolph. For a while he worked around Christchurch and surrounding area on various farms. Later he was working in the Temuka, MacKenzie Country and Geraldine areas. In 1875, William joined the Police, serving at a number of stations in the Canterbury area, before moving up to Marlborough. By the late 1890's, he was based at stations in the Waiarapa. He retired in 1910, having gained the rank of Sergeant at the Hastings Station. "1st Class Constable William Smart is wearing the uniform of the Canterbury Armed Police of 1875. The letter "A" above the number on his glazed cap was introduced on 16th March 1872. His belt provides for the carriage of a lantern and sword as well as the handcuff pouch shown in the photograph. Constable Smart was born in March 1850 in North Hampshire, England and arrived in New Zealand in his first year with the pilgrim families to Canterbury. In 1875 he joined the Canterbury Armed Police. He served for period at Rakaia (then part of the Timaru Sub District). He spent 21 years in the South Island before transferring to Hastings as a Sergeant. He retired in 1910 and died in 1935." William also served on the Hawkes Bay Rivers and Napier Harbour Boards. He was a Justice of the Peace and was a committee member of the Hawkes Bay Agricultural and Pastorial Society. William married Mary MOODY on 18 July 1877 in Kaiapoi. Mary was born on 28 June 1867 in Hathern, Leicestershire, England and died on 26 January 1944, and was buried the next day in the Havelock North Cemetery near Hastings. William died on 31 March 1935 in Havelock North and is buried in the cemetery there. Frances Mary SMART was born on 12 May 1878 in Ashburton and died on 4 November 1973 in Timaru and is buried in the Timaru Cemetery. She married John TATE about 1897 and they had two children. Her second marriage was to William Leonard WAKELIN about 1910 in Greytown, near Carterton and there were five children from this marriage. Henry William SMART was born on 7 June 1879 in Akaroa and was baptised at St Andrews Anglican Church in Little River on 24 August 1879 and died on 8 October 1968 in Palmerston North and was buried in Ashhurst, near Palmerston North the next day. 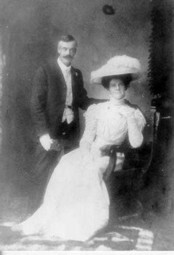 He married Anne EMERSON on 3 September 1903 in Woodville. They had three children. 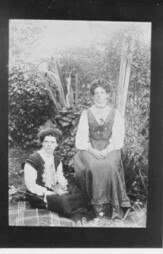 After the death of Anne, Henry married Anne's sister Julia about 1909 and had a further three children. Leslie Horton SMART was born on 24 January 1882 in Akaroa and was baptised at St Andrews Anglican Church in Little River on 26 March 1882 and died on 16 April 1954 in Carterton and is buried in the Clareville Cemetery near Carterton. 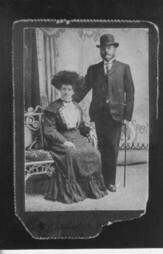 He married Wilhemina SIMPSON about 1907. They had four children. Irene Alice SMART was born on 18 September 1887 in Kaikoura. She married Jack Samuel PATTERSON about 1915. They had four children. Elsie Gladys SMART was born on 4 July 1889 in Kaikoura and died about 1990 in greymouth and is buried in Hokitika. She married James Henry CROPPER about 1920. They had four children. Harold Gordon SMART was born about 1892 in Kaikoura and died on 27 February 1980 in Palmerston North (a death date of 5 June 1967 has been suggested) and was cremated soon afterwards. He married Grace EDGECUMBE about 1922. There are no known children. His second marriage was to Beatrice Clark HARVEY about 1960. There are no known children. Dorothy Randal SMART was born on 3 January 1897 in Carterton and died on 17 August 1993 in Havelock North. She married Walter George FULFORD about 1918. They had seven children.